The Stranglers are mixing it up. Not, as in the past, by tying up journalists and encouraging female acquaintances to take to the stage naked. No, the 2019 incarnation is nightly mixing up the set with tracks both revered and unrecorded. After ploughing the middle ground for much of this decade, The Stranglers once again feel left field and vital. This month marks their tenth consecutive annual spring tour, and with it comes the flowing of creative juices. Frontmen JJ Burnel and Baz Warne have raided their collective iPhone sound files and whittled them down to a new album's worth of material. But first came the time honoured entrance music of Waltz in Black, followed by the blistering opener in the form of Tank, the lead track from the band's third album, Black and White. Being JJ (bass) side, the rumble of his four strings sunk deep, complimented by the seemingly effortless guitar work of Warne. 'Drummer & tech wizard' Jim Macaulay pounded away as though his life depended on it .. and keyboard legend Dave Greenfield seemed to be happily inhabiting the unnamed planet he's been adrift on for the last four-plus decades. Set highlights came in the form of Baroque Bordello/ The Raven (The Raven), Ice Queen/Uptown (Aural Sculpture), Hey! (Rise of the Robots) (Black & White) and Down in the Sewer (Rattus Norvegicus). Newbies Man On the Moon & Payday suffer from the quality of material on display, but repeated listens, as per recent live outings of the unrecorded Water, would give a better indication of their long-term worth. Great crowd, blinding set, well received support (Dr Feelgood), and a band back in touch with its creative mojo. 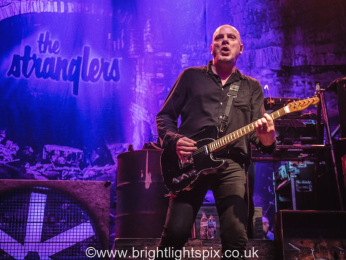 Top, top night ..
For more info on The Stranglers and their forthcoming live dates Click Here ..